The New York State Department of Motor Vehicles (DMV) is responsible for issuing driver's licenses and ID cards to all teen drivers in New York. Prior to applying for your first New York driver's license, you must satisfy the New York graduated driver license law (GDL) requirements. If you are younger than 16 years old, you are not allowed to drive in New York under any circumstances―even if you hold a permit or driver's license in another state. If you already have a full driver's license in another state, you must apply for a NY driver's license within 30 days and surrender your previous out-of-state license. You CANNOT exchange an out-of-state learner's permit for a NY learner's permit or driver's license. You must first apply for a NY learner's permit using the application process listed below. You will need to satisfy all New York graduated license program (GDL) requirements and follow all driving restrictions. Surrender your out-of-state driver's license, if you have it. Submit a completed Application for Driver License or Non-Driver ID Card (Form MV-44). Show your Social Security card, or proof of your ineligibility. Pass a vision exam OR submit a completed Vision Test Report (Form MV-619). Pay the driver's license fee. There is no fee for utilizing the notification service. If you wish to enroll in TEENS, you may do so online via MyDMV, or in person at your local DMV office. If you choose to enroll an out-of-state learner's permit, you must fill out the Teen Electronic Event Notification Service (TEENS) Enrollment and Consent (Form MV-TEENS) and submit it when your teen applies for their learner's permit. NOTE: The program will automatically expire when your teen turns 18 years old. A state-approved driver's education course. At 17 years old, you are eligible to change your junior driver's license to a senior driver's license if you complete a state-approved Driver's Ed course. To do so, present your Driver Education Certificate (Form MV-285) to the NY DMV, along with your junior driver's license. If you do not complete a driver's education program, you must wait until you are 18 years old to obtain your senior driver's license. 16 years old: Eligible for learner's permit. 16 years old with permit: Eligible for junior driver's license/provisional license. 17 years old (with driver's education): Eligible for senior driver's license. If you're at least 16 years old, you can apply for a New York learner's permit. Provide proof of your identity and date of birth that meets the required 6 points. The New York DMV provides a list of acceptable proofs and point values. Provide your Social Security card or proof of your ineligibility. Submit a completed Application for Driver License or Non-Driver ID (Form MV-44) with your parent or guardian's signature of consent. Pass a vision test, or bring a completed Vision Test Report (Form MV-619) from your eye doctor. Pay the permit fee, which varies based upon your age and county of residence. Visit the NY DMV's fees page for a complete list of permit and license fees. Ace Your Exam on the First Try! 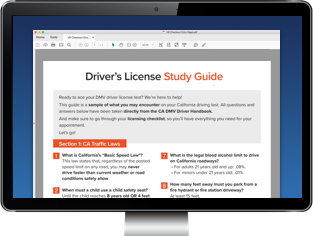 Don't leave your permit test to chance—take our free permit practice test with questions directly from the NY driver handbook. It's the fastest, easiest way to set yourself up for success! Once you have your learner's permit, you must complete either a NY pre-licensing course or high school or college Driver's Ed course. For more information, visit our Drivers Ed in New York page. You must hold your learner's permit for at least 6 months before you can take your road test. You must also complete at least 50 hours of driving, including 15 hours at night. You can only drive while accompanied by a licensed driver who is 21 years old or older. You and all passengers must wear seat belts or proper child restraints at all times. You may NOT drive in a DMV road-test area. You may NOT drive on any street within a park in New York City, or on any bridge or tunnel within the jurisdiction of the Triborough Bridge & Tunnel Authority. Long Island (Nassau and Suffolk). After you've held your NY learner's permit for at least 6 months, you're ready to get your junior driver's license. Make sure you've completed your required 50 hours of supervised driving, including 15 hours at night. ―Driver's Education Certificate (Form MV-285). ―A pre-licensing course certificate (Form MV-278). A Certification of Supervised Driving (Form MV-262) completed by your parent/guardian, certifying that you completed your 50 hours of supervised driving. The registration and proof of insurance for the vehicle you're testing in. After you pass your DMV road test, you will receive your Class JD junior driver's license. If you break any of these rules or are convicted of any other traffic violation, your junior license will be suspended for 60 days. If you are convicted of another violation within 6 months of reinstating your driving privileges, the NY DMV will revoke your license for 60 days. There are other restrictions you may need to follow depending on which areas in New York you will be driving. Visit the NY DMV website for more information. You will receive your full driver's license once you turn 18 years old. If you've taken Driver's Ed, you are eligible for your full driver's license when you are 17 years old. Once you turn 18 years old, the NY DMV will automatically upgrade your junior driver's license/provisional license to a senior driver's license. Your new license will arrive in the mail. As mentioned above, you can upgrade to your senior driver's license at 17 years old if you've taken a Driver's Ed course. Simply bring the Driver's Education Certificate (Form MV-285) to the DMV office with your junior driver's license, and you will be issued a senior driver's license. Track and share your steps as you move towards your full New York driver's license with the new license checklist. Distracted driving is among the leading causes of fatal accidents for young drivers. Remember to always keep your eyes on the road while you are driving. You can learn more about the dangers of driving distracted on the Distracted Driving section of our website. You are required by New York law to carry auto insurance whenever you get behind the wheel. However, depending upon what type of permit or license you have, you may be covered under the insurance of your supervising driver. Teens with New York learner's permits may be covered under the insurance of the adult licensed driver who is supervising them―whether it's their parent/guardian, driving instructor, or other supervising driver. Otherwise, you either need to explore getting your own car insurance, or have your parent/guardian put you on their policy. Teens are required to show proof of insurance at their driving test in order to obtain a junior license in New York. You have the option of being added to your family's existing policy, a parent's policy, or your may get your own policy. Teen Guide to Car Insurance. Buying Car Insurance for Teens. Saving Money on Teen Car Insurance. Adding Teens to Your Car Insurance Policy. To ride a motorcycle in New York, you must have a Class M or MJ motorcycle license. Teens must follow all of the steps and provisions outlined above in the licensing process for a regular NY driver's license, including the requirement for a Driver's Education or pre-licensing course before taking your road test (only if you don't already have another class of driver's license). Complete and submit an Application for Driver License or Non-Driver ID Card (Form MV-44). Submit acceptable proofs of identity totaling 6 points. Pay any applicable fees (motorcycle permit fees range from $21 to $120, depending on your age and location). ―A NY pre-licensing course certificate (Form MV-278). This course is 5 hours. The registration and proof of insurance for the motorcycle you're taking the driving test on. Bring your temporary motorcycle license, motorcycle permit, and current junior or senior driver's license to the DMV. Fill out an Application for Driver License (Form MV-44) and check the box on the form that says “Change." In the box that says “Other Change," write “Add Class M (or MJ)." Pay the $12.50 driver's license document fee. You will receive a temporary driver's license, and your new license will be mailed to you in approximately 2 weeks. If you do not already have a junior or senior driver's license, your motorcycle license will be mailed to you within approximately 2 weeks. The NY DMV will waive your motorcycle skills test if you complete an approved motorcycle rider skills course. You must be at least 16 years old, and hold a valid New York driver's license AND hold a class M or MJ learner's permit. For more information, please visit the Motorcycle Safety Foundation's New York Program. Submit this form to the NY DMV after completing an approved pre-licensing course. Can only be obtained from your driver's education provider. Not available online. Submit this form to the New York DMV after completing a Driver's Ed course (classroom AND behind-the-wheel education) to be eligible for an unrestricted license. Must be obtained from your Driver's Ed provider. Not available online. Submit this form in lieu of taking a vision exam at the NY DMV when applying for your driver's license. Must be completed by a medical professional. Submit this form to enroll in the NY DMV's Teen Electronic Event Notification Service (TEENS). TEENS will send you notifications of your teen driver's tickets, suspensions, and accidents. Submit this form to verify you've completed the required amount of behind-the-wheel practice hours while holding a NY junior permit (Class DJ or MJ).